The Israeli Defense Force (IDF) selected two names for Israel’s current military assault against an imprisoned Gaza population. This is a military that thinks seriously about naming its military assaults. The first name given the second Gaza invasion in four years is “Pillar of Cloud” (Amud Anan in Hebrew). It was intended for use in Israeli media and was for Hebrew-speakers. The second name,”Pillar of Defense” was designed for the rest of us, those who are, presumably, less biblically informed. The Tablet magazine, a U.S.-based, openly Jewish, Israeli-friendly, publication, explains that “Pillar of Cloud” comes from “a direct biblical allusion to the divine cloud which guided the Israelites through the desert and shielded them from those who might do them harm”. “For a campaign intended to halt the barrage of rockets currently raining down on southern Israel, “Pillar of Cloud” is thus a particularly apt title. Just as the cloud protected the Israelites from Egyptian projectiles, so too does the IDF hope to protect Israel’s citizens. Non-Hebrew speakers, all of whom the Tablet brands as belonging to a “lay audience”, are not asked to think of the IDF as God’s avatar, as are Hebrew language speakers. By not using the Exodus reference to “Pillar of Cloud” outside of Israel, the IDF appears to have forgotten that there is a segment of the U.S. population that strongly supports Israel on religious grounds. I refer not to the U.S. Jewish voters who favored Obama over Netanyahu’s candidate, Romney, by a 70% margin, but rather, to the self-described white born-again Christian evangelicals who would be thrilled to connect present-day Israel with the ancient Israelites. The Huffington Post reports that white born-again Christian evangelicals chose Romney over Obama by a 70% to 29% margin, ironically, the same vote difference Jewish voters cast in favor of Obama. The times, they are a-changing. Not much change is in evidence in Israel’s conservative government, however, where leaders keep following the same old narrative to justify each new assault on its weakest Arab neighbor, the neighbor Israel has confined to an outdoor prison. In both 2008 and now in 2012, the Gaza assault followed a U.S. presidential election and preceded the inauguration of the winner of that election. Israel’s rationale for attacking Gaza in 2008 is exactly the same rationale Prime Minister Benjamin Netanyahu offers as the reason for Israel’s current “Pillar of Cloud” attack. During the 2012 U.S. election campaign, Netanyahu tried unsuccessfully to bully candidate Barack Obama into pledging to follow Israel into an airstrike against Iran, which Netanyahu deemed a dangerous threat to Israel’s survival. Once he failed to lead Obama into joining his Iranian folly, Netanyahu, who knows full well his own IDF lacks the ability to go to war against any of Israel’s strongest neighbors without U.S. backing, turned south to Gaza and discovered, what do you know, now it is Gaza which threatens constant rocket attacks against more than “a million Israelis every day”. When did this current Gaza invasion begin? The Institute of Middle East Understanding prepared a timeline of events leading up to Wednesday’s assassination of Hamas leader Ahmed Al-Jaabara in Gaza City, The killing of Hamas’ number two military leader was expected to bring a violent response from Hamas. On Thursday, November 8, following a two-week lull in violence, Israeli soldiers invade Gaza. In the resulting exchange of gunfire with Palestinian fighters, a 12-year-old boy is killed by an Israeli bullet while he plays soccer. Shortly afterwards, Palestinian fighters blow up a tunnel along the Gaza-Israel frontier, injuring one Israeli soldier. On Saturday, an anti-tank missile fired by Palestinian fighters wounds four Israeli soldiers driving in a jeep along the Israel-Gaza boundary. Sunday, November 11, one Palestinian civilian is killed and dozens more wounded in Israeli attacks. Four Israeli civilians are also injured as a result of projectiles launched from Gaza, according to the Israeli government. During an Israeli government cabinet meeting, Transportation Minister Yisrael Katz urges the government to “cut off the head of the snake… take out the leadership of Hamas in Gaza.” He also calls for a cutting off of water, food, electricity, and fuel shipments to Gaza’s 1.7 million people. Monday, November 12, Palestinian militant factions agree to a truce if Israel ends its attacks. On Monday, Benjamin Netanyahu played his role in softening opposition to his well-planned invasion. He spoke to 44 foreign ambassadors at a meeting Israel arranged in Ashkelon, in Southern Israel. The purpose of this event was to describe the rockets from Gaza as a dire threat against Israeli citizens. What Netanyahu said to the ambassadors about Israel’s “right to defend itself” applies equally to the Palestinians who are held down by Israel’s occupation. Is Netanyahu so caught up in his own Israel First mindset that he does not grasp the reality that at least some of these 44 ambassadors might just be giving some thought to a perspective other than the one Netanyahu describes with such uncomprehending earnestness? Some of these ambassadors must have come from countries that have gone through their own struggles against outside colonizers. During his presentation, Netanyahu warned, referring to the rocket attacks Israel has provoked from one faction of militants inside Gaza, “We are going to take whatever action is necessary to put a stop to this. This is not merely our right, it is also our duty”. Netanyahu had to be aware that one action he had already ordered was the assassination of Ahmed Al-Jaabari, the head of Hamas’ military wing. Two days later, on Wednesday, November 14, Jaabari was killed by an Israeli precision air strike as he was being driven down a crowded Gaza City street. 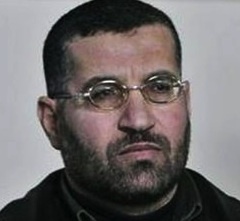 The military leader (pictured here) survived several Israeli targeted assassination attempts and was lightly injured in one of the attempts in 2004. His eldest son Muhammad, was killed in that attack, along with his brother and three other relatives when Israeli helicopters targeted al-Jaabari’s home in Shujaiyya. Al-Jaabari gained particular prominence for his role in capturing Israeli soldier Gilad Shalit who was seized in a cross-border operation by three Palestinian factions in 2006. It has been clear for over a year that Israel would wait until after the American elections to launch some act of military aggression, and it was clear, to me, at least, that it would not be directed against Iran, Syria, or Lebanon. It seems likely that Israel had decided to conduct an operation in Gaza before the first rocket was fired from Gaza. All military actions, indeed, all actions having to do with Gaza, have one goal in mind: the subjugation of the Palestinian people there with minimum cost to Israel. In hasbara speak this is called “protecting Israelis,” “defeating terror,” “defending national security,” even “protecting national honor,” but it boils down to the same thing — Israel cannot be secure if the Palestinians have real independence. The ending of this assault will depend on a decision by Israel’s Prime Minister, the same leader who determined when it would begin. Netanyahu may have misjudged Egypt’s reaction to “Pillar of Cloud”. By Friday, November 16, Egypt had sent its Prime Minister, Hesham Kandil into Gaza. Kandil met with Hamas leader Ismail Haniyeh and visited wounded Palestinians at a hospital. During Israel’s 2008 invasion, Time magazine’s Tony Karon wrote this week, then-Egyptian President Hosni Mubarak served “as the wall at Hamas’ back in Gaza, tacitly supporting Israel’s efforts to break the grip of a movement aligned with his own Muslim Brotherhood nemesis”. Today, Mubarak no longer leads Egypt. Israel’s parliamentary election, January 22, will determine if Benjamin Netanyahu continues as prime minister. If things do not go well for Israel in this military endeavor, the voters might turn against their war-obsessed leader. The Arab Spring continues to have a ripple effect that has already toppled several Arab leaders. Will it bring down Netanyahu? Probably not, since Israeli voters have been traumatized by their leaders into believing Netanyahu is their only hope. Meanwhile outside of Israel, the mantra, “Israel has a right to defend itself”, no longer has the cache Netanyahu thinks it has. World opinion is shifting, slowly, to be sure, but how many more Gaza deaths will the outside world tolerate? Exodus 14:19-20 does not guarantee that the “Pillar of Cloud” will always defend the Israelites against the Egyptians. 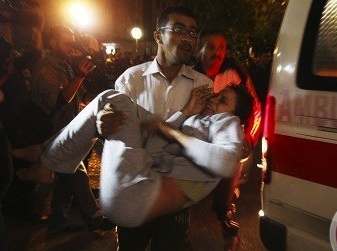 In the picture at the top, a Palestinian ambulance worker carries a wounded man after an Israeli air raid. The photo is from Ma’an. It is one of a series of pictures by Reuters photographers Ahmed Zakot, Ibraheem Abu Mustafa, Mohammed Salem and Ali Hassan. This entry was posted in Middle East Politics, Netanyahu, Obama, Politics and Elections. Bookmark the permalink. Israel is a synonym for Evil! Netanyahu is a synonym for EVIL! GOOD WILL TRIUMPH OVER EVIL!!!! The US has helped to create this warmongering Israel with our billions of dollars in weapons aid. The assasinations Israel uses is more suited to the mafia than a state. Gaza has no army, navy or airforce. Israel has had a blockade on Gaza for several years. The blockade itself is an act of war. War against defenseless people is clearly cowardly. Both the US and Israel seem to excell as bullies. It is sickening, and the people of Gaza are now facing another hell from the monster we helped to create, and our nation will give Israwel its full support. How shameful we’ve become. Today the NY Times reported that aid to Honduras is being held and more may be removed due to the death of one teenager by police action. What will it take for Washington to do the same to Israel’s military aid? Obviously 1400 Gazans (Operation Cast Lead) aren’t worth as much as one Honduran. They keep telling us Israel is our only ally in the Mideast. If we keep this up, we will guarantee that it remains our only ally there. If I understood her correctly, on the radio this morning Phyllis Bennis said that al Jaabara was a key figure in negotiation the release of the Israeli soldier, Shalit, and that he was involved in current negotiations for a cease fire between Gaza and Israel. Bennis was speaking on KPFA’s 8:00 show. If I have this right then Israel is demonstrating by assassinating al Jaabara that they have no intention of negotiating a peaceful relationship with their closest neighbor. I also remember that the siege of Gaza was initiated upon the legitimate electoral win of Hamas in the Palestinian elections. No attack or any other “justification”, just the clear refusal to let Palestinians elect their own government. Empires are like that. See U.S. and its neighbors — from Chile to Haiti and many others. If I understood her correctly, Phyllis Bennis said this morning on KPFA’s 8:00 a.m. show that al Jaabara was involved in negotiation the release of Israeli soldier Shalit. She said that al Jaabara was leading negotiations between Israel and Gaza for a long term cease fire. If this is correct, Israel’s assassination of this man is a clear indication of their disinterest in living at peace with their closest neighbor. The only thing Israel learned from the Holocaust was technique, how to subjegate an indigenous people. The parallels are too numerous to point out. Thank you, Jim, for quickly reviewing the sequence of events, which contradict Israel’s “cloudy” memory syndrome. In modern times, the ancient Israelite, “Pillar of Cloud”, is actually nothing more than “Godless Zionist Master Spin” that is so thick with deceipt and lies” that it has turned into dark clouds heavily laden with crimes against humanity, usurpation of Palestinian lands, Apartheid, and blatant expansion. Here is my humble attempt to share in interpreting the latest events. I suspect that Israel’s main goal is still to do with “disarming” Iran and destroying it, with US/Old Colonial European support. Let’s keep our eyes on the ball, while watching how this unfolds. Netanyahu and Co. want to destroy Iran ONLY because it is the ONE remaining power in the Middle East that can militarily potentially challenge Israel’s occupation of Palestine, (after the destruction of Iraq and neutralizing Egypt, and the current destruction of Syria). For Israel, to do so with least possible losses, Israel wants to ensure no interference from Gaza (Hamas) or Lebanon (Hezbollah’s), while Israel, or its side-kick, pulverizes Iran. The same will soon apply in Lebanon, when Israel will induce a clash with Hezbollah. This is a more capable force than Hamas and is closer to Iran’s perspective for the region. Israel wants to ensure the destruction of Hezbollah, prior to any entanglement with Iran. Cake walk like 2006? Meantime, In Jordan’s recent turmoil and dangerous anti-monarchy developments, Israel is salivating as it continues observing the situation and readying itself to capitalise on any opportunity that allows it to throw out the Palestinians of Israel ’48 and those remaining in East Jerusalem, the West Bank, and Gaza, in order to “ship” them all to Jordan and falsely declare that “Palestine is Jordan”. Meantime, an article in “The New york Times”, November 15, 2012, talks about Israel’s US side kick operating in the Gulf. The article talks about robotic mine sweepers and “Underwater Drones” that can target mines, small boats and submarines. The state-of-the-art “Bunker Busters” can do their work against Iran’s underground facilities that Israel labels as imminent “nuclear bomb workshops”. Are more pillars of clouds billowing in the skies? So, the US forces can clear out any disruption of potential Iranian mining or obstructing the Straits of Hormuz, “within a few days”. Another cake walk? Will the Biblical “Pillar of Cloud” anchor protectively behind the Palestinian people’s back, to protect them from the invading hordes of European Zionist? In reference to Carolyn’s message above, this is an excellent article from Ha’aretz that refers to the fact that there was a ceasefire in the making, coordinated with Al Jabari, when he was assassinated. By imposing a political reality upon a biblical narrative, seems that The Tablet’s biblical allusion is an old, rehashed fictitious illusion. New wine skin on an old bottle. The parallels don’t really parallel. The Pillar of a Cloud by day and Fire by night in Exodus 13:21 have been replaced by Israel’s Pillar of White Phosphorous Clouds by day and U.S.-taxpayer-funded, mortar rocket Fire by night. It is hard to believe that Mark Twain’s propaganda narrative would be used in any defense for what is happening in Palestine today. When I saw the reality on the ground, I was traumatized and returned home physically sick. Yet, more than a year later, I am continually saddened for the Palestinian children—who are among the world’s most beautiful. And here we are four years after the 2008 Gaza massacre: same ol’ rehashed crime, complete with much silence from world leaders. How long, oh Lord, must the Palestinian cry? How long, oh Lord, must his children die? How long, oh Lord, will justice remain an outstanding debit? Oh yes, Lord, the wilderness has an entrance AND an exit! These godless Zionists — whether of Jewish, “Christian,” or secular stripe — must be outed for the psychotic criminals they, and their evil ideology, are. How to do so escapes me, because their methodology is so carefully crafted and executed…with the uber-intense focus of deep-seated, irremediable, certifiable madness. Thanks again, Jim, for your forthright telling of truth. It is very clear to me that Israel will never negotiate peace because they do not want a separate Palestinian state next to them. What this really means is that there will never be an Israeli partner for peace to sit down at a negotiating table along with the Palestinians. It is time that the United States Middle East foreign policy reflect this reality. Some readers may have wondered why this posting has a spelling different from other media outlets for the name of Ahmed Al-Jaabari, the head of Hamas’ military wing. There is a reason for this difference. In these postings, Wall Writings makes every effort to show respect for the Arabic language and culture. In using English language transliterations from the original Arabic. I feel that it is both respectful and accurate to rely on Arabic language sources for accuracy in spelling. In reporting on the assassination of Ahmed Al-Jaabari, the head of Hamas’ military wing, Ma’an, an English language Palestinian site, spells Ahmed Al-Jaaban’s last name with two English language “a” letters. I have chosen to utilize the Ma’an spelling rather than incorrectly (see the New York Times) spelling that uses a single “a”. I have done this because there are two ways to transliterate the second letter of Al-Jaabari’s last name from Arabic to English, neither of which is used by, for example, the New York Times. In Arabic, the second letter in Al-Jaabari’s name is pronounced, “ahyn” which is is not an “a” sound. There is no equivalent English letter with which to transliterate “ahyn” from Aabic to English. In translating the Arabic language into English it is correct to use either the English double “a” to connote “ahyn”, or, as a second option, it is correct to place an apostrophe after the “a” to indicate, with the use of a diacritic mark that the letter is pronounced “ahyn” and not “a”. The letter in Arabic which translates into an English “a” is pronounced “alif” with a hard English “a”. Both English and Arabic begin their alphabets with the “alif”, or “a” sound. Let the New York Times follow the incorrect spelling of “ahyn” and use only a single “a”. As for me and this house, we will spell it as a double “a”.